Kiranmala has spent the past twelve years of her life in New Jersey, living as a typical sixth grader. Yes, she thinks her parents are weird, but don't many pre-teens believe this? Is it so weird that her parents make her dress as a princess EVERY Halloween? That they tell her stories of her real father, the underworld serpent king? Or that they seem to believe she is royalty? Maybe Kiranmala's parents are a bit stranger than most. On her twelfth birthday, the day of Halloween, she finds out why and her entire world becomes very strange. Her parents disappear, leaving a mysterious note about a spell that has worn off. Two princes show up on her door step. A rakkosh demon is after her. Kiranmala, as it turns out, is an Indian princess after all. 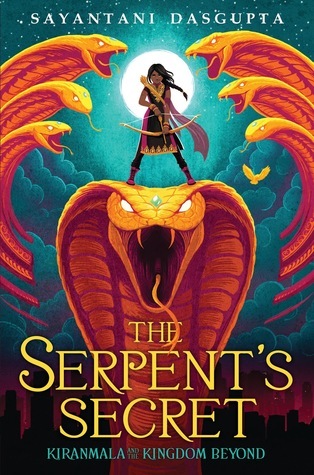 The Serpent's Secret will transport readers to the imaginary world of Bengali folktales, with demons, evil snakes, and untrustworthy kings as Kiranamala goes on a search for her parents. With courage and humor, Kiranmala is an admirable, but fun heroine. Action fills the pages as Kiranmala's quest places her in situations in which she must battle evil and escape the magical powers of those that want to do her and her friends harm. Enjoying this story is possible even without having familiarity with the folktales on which it is based. The author provides background information about the mythical characters that appear in the book in an end note. I received an advanced reader's copy of this book at the National Council of Teachers of English annual Convention, thanks to the publisher, Scholastic. This book publishes in February.